Bistro Union isn't as straight-bat French as the Bistro title implies, or quite as 'quintessentially British' as the website announces. The smallish restaurant's had a recent refurb and it's looking lovely, in the international language of warm lighting, gleaming wood and walls lined with things you want to drink. British produce scatters the menu, true: Aylesbury duck, White Park beef, Cornish mussels. But dishes bounces around influences — pies and pithivier, chimichurri and chowder, roasts and confits — with an approach more aimed at plating up sheer pleasure than any particular devotion to region. If that sounds like hyperbole, there's worse to come. You might expect a spot with home-cured charcuterie hanging from the ceiling to be less focused on a non-meat offering. The vegan menu's short, but punching well above its length. Some sort of alchemy turns a salad of brassicas, artichokes, shaved and grated chestnuts, pickled quince and truffle oil into one of the most powerfully flavoured and compelling things — vegan or otherwise — we've eaten in weeks. That's up against stiff competition from the meat dishes, though. 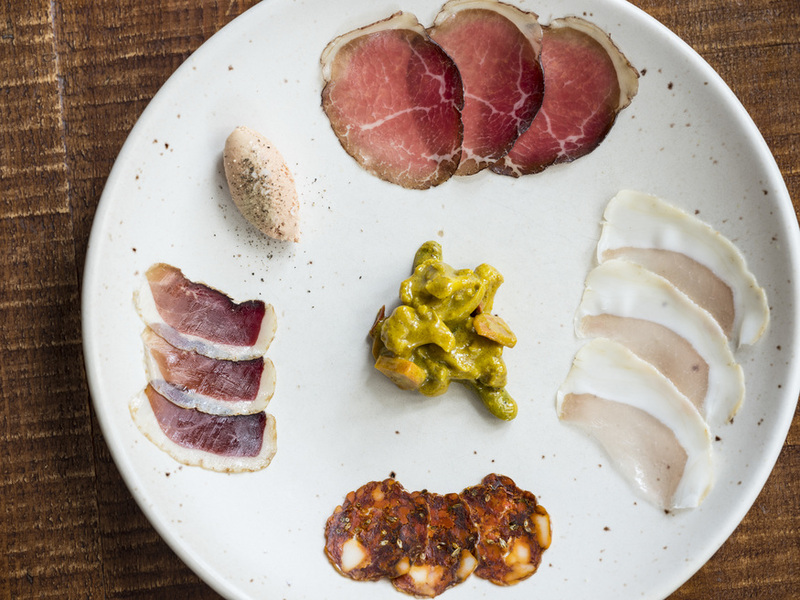 The plate of charcuterie is a tiny, delicate-looking arrangement of shavings — fennel salami, duck ham, lomo — each of them so fattily, perfectly meaty, that more than a sliver would be overpowering. A bavette comes cooked over olive wood — described by our waiter as 'smelling like the barbeques you get on Spanish beaches' — and served up as an insanely generous plateful of slices, Christmassy in the rareness of the beef against the vivid green of the chimichurri. Chips are thick rectangles, so perfectly burnished they look like they're glowing with an inner light. In fact, if we have one charge to level at the menu here, it's that really, honestly, sharing the bavette and chips would have been a wiser move; the £16 dish would easily feed two, and our confit duck leg is glorious overkill. And while the a la carte menu's seriously delivering for the price — particularly if you take our advice and share — there are other, cheaper ways to be excited about Bistro Union. Sunday offers BYO wine with free corkage. Happy hour runs 6-8pm from Tuesday to Thursday, with selected cocktails for £5. If our Honey & Ginger Old Fashioned or seaweed tincture martini are anything to go by, that's an outrageous amount of skill and spirit-warming joy for your money. Be warned, though. Happy hour at Bistro Union might be less of a bargain, and more of a gateway drug into their dangerously habit-forming neighbourhood restaurant. Bistro Union, 40 Abbeville Road, SW4 9NG.